Helpful advice on selecting and replacing your rechargeable solar light batteries. It can be very frustrating when your solar lights stop working; here are a few helpful tips to get them up and working again. 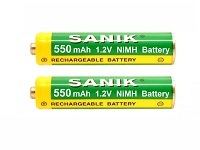 Q. I have NiCad (Nickel Cadmium) batteries in my solar lights, can I replace them with NiMH (Nickel Metal Hydride)? A. Yes you can replace your old solar light NiCad batteries with rechargeable NiMH solar light batteries which are best batteries for solar lights. You just need to check that they are 1.2V (1.2Volts) and try to match the mAh figure on the battery as closely as possible. Q .How can I check that it is the battery which is not working in my solar lights, before I replace the batteries? A. If your solar lights have stopped working firstly check that the bulb or LED's are working by placing a non-rechargeable battery in the solar light, place it in the dark to activate the senor on the light - if the light works then you should replace the rechargeable solar light batteries. Q. How do I make sure I get the correct replacement batteries for my solar lights? A. Using the information on your old solar light battery, first check the size, capacity the mAH or power the battery has, then select the nearest to the batteries we have listed. As an example you may have a NiCad AA 1.2 V 600 mAh battery then you should replace it with the NiMH AA 1.2V 600 mAh batteries. Q. Is it a good idea to charge the new batteries in a battery charger before putting them in my solar lights? A. All new batteries come with different amounts of charge in them some can be completely flat so yes they would benefit from a charge in a battery charger. However do not worry if you do not have a charger just put them in the solar lights and once they get some sun they will start to charge. The lights should take a full day of sun to charge before using them at night. Q. Should I clean my lights to make sure they charge fully? A. It is a good idea to regularly clean the solar panel on your lights this helps to ensure that the batteries will receive the maximum amount of light to help them charge. If you have any questions or cannot see the replacement battery for your solar lights listed please call us on 01474 705832 we will be only too happy to help.